While the RML team was at Snetterton yesterday (March 24) for the final shakedown of the MG Lola EX264 ahead of the official Paul Ricard test next week, a fair amount of time was devoted to sorting out the seating positions for the drivers. Glen Macdonald (right) of the intriguingly named “Bald Spot Sports” organisation had flown in especially from the States to assist. His company is responsible for developing a totally new seating infill procedure that will see RML’s MG Lola as one of the first applications of the product outside American single-seater racing. 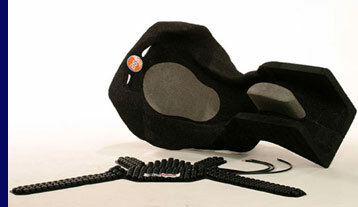 Widely used in IRL and Champcar, and imminently under test for use in F1 from next season, the technique is far removed from the familiar two-part foam and a bin-liner method that will have warmed the bottoms of many British racing drivers over the years. This is a granular system called Creafoam, that is vacuum fitted to the driver. It takes a little longer to set off, allowing the technicians to achieve a near-perfect fit on the first attempt - without the associated heat and discomfort. That’s just the start, however. After some further fittings and adjustment, the prototype seat (that now conforms perfectly to the contours of the driver) is scanned into a computer as a 3D virtual model, and then the final seat is carved from a single block of higher density multiple-impact Creafoam. 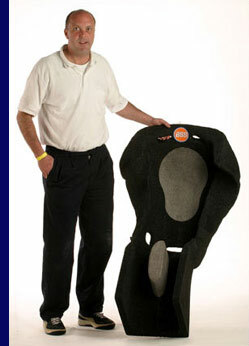 The area of the new seat at the back, from shoulders down to the base of the driver’s spine, where the greatest forces are usually concentrated during any (hopefully unlikely) impact, is then removed, and replaced with a “plug” of special single-impact foam that can be removed and replaced after an accident, but it’s very clever stuff. This is the truly significant difference between old and new systems - the way they behave in the event of an accident. The old fashioned foam is very rigid, and offers little cushioning effect on impact. Intense levels of G are generated when a racing car hits the barriers, with readings as high as 80 G having been recorded in exceptional circumstances. While there’s no rattling around like a stone in a tin can with the old system, all those forces are still transferred straight through to the driver, resulting in possible broken bones and the likelihood of internal injury. The new foam responds very differently. During normal racing, when G forces are applied gradually and progressively as the car corners, accelerates or brakes, the infill is rigid and firm, much as is the case with the old two-pack material. In the event of an accident, however, when G forces suddenly increase dramatically, the results are very different. In itself, the multiple impact foam that forms the bulk of the seat is proven to be significantly more effective at absorbing the loads of impact, and also better at preventing intrusion from panels and mechanical parts, but that’s just the start. It’s the ‘plug’ that makes the revolutionary contribution. The whole structure of the material changes on impact, absorbing and dissipating the G forces progressively, cushioning the blow. Tested in situations – real and laboratory – up to 75 G, the Creafoam system works so well that it looks set to become the approved system throughout the top levels of motorsport in the coming seasons. Dovetailing with the Creafoam seating system, BSS has also developed a seat-belt cushioning technology that is equally revolutionary. Positioned between the conventional webbing and the driver’s shoulders is a strap that looks like glorified bubblewrap - see image right. Each bubble is not filled with air, but a putty-like substance that feels a bit like plasticine. Hit it hard, however, and it instantly changes into something with the consistency of soft toothpaste. 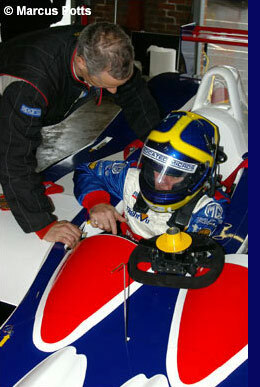 Glen Macdonald demonstrated this by placing a strip, about one centimeter thick, onto the concrete floor of the Snetterton garage. He then proceeded to punch this, very hard, with his knuckled fist. He didn’t even wince, although it looked as though he ought to have been in excruciating pain. Impressive stuff.